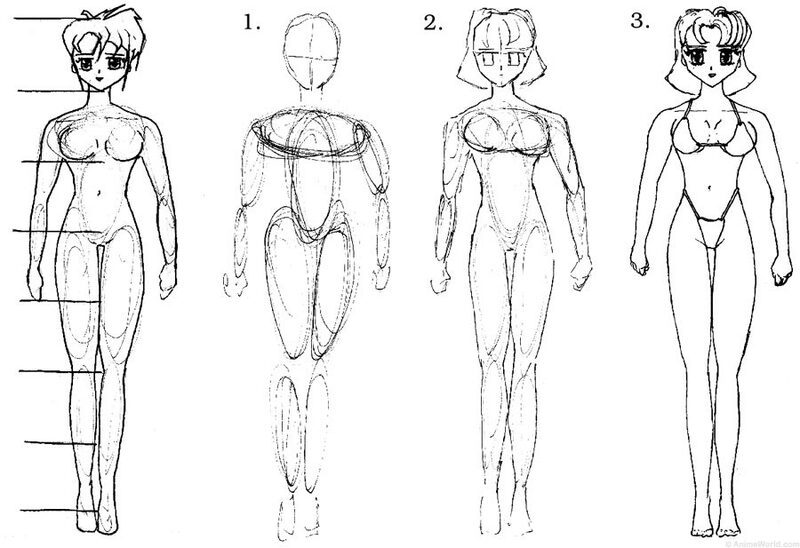 As with faces, the anime- or manga-style body is just an exaggeration of a regular person. The amount you want to exaggerate your figures is up to you and the style you like. Vertically, the main changes are a shorter torso and longer legs. 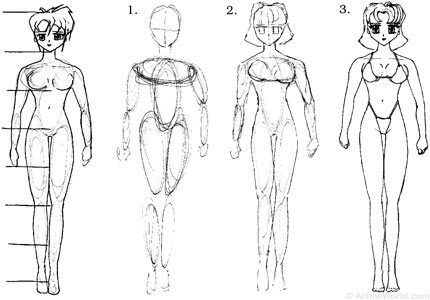 Other than that, you just have to take the features of an idealized woman and make them even more ideal: Long and thin arms and legs (some folks like their legs very long, but it isn't necessary), small body and slim waist (yeah, yeah, and a big chest--but that isn't necessary either), usually the hips are pretty slim, and a long, thin neck. Make sure to keep the head fairly large--the human head doesn't change in size over a lifetime as dramatically as the rest of the body (I'm sure you've noticed little kids have big heads), so the smaller you make the body in proportion to the head, the more "little girl" like your character will be. There are many ways to block out your figure, but I recommend the bubble method (it's the one I use, and I think it's the easiest and most effective). Just scribble in some ovals like the ones in the diagram to rough out the form, keeping it as loose and light as possible. Make sure you get the proportions like you want them before you move on--it's more than a little frustrating to spent a load of time on the details and then realize that those perfect arms you just finished are way too short. If you're not sure about something you can use the proportional diagram to check. If you're worried about getting it right you can start by drawing the head a good size (I did these drawings with a 1 inch head unit) and marking where the arms should reach and where the knees should be and all that. You might also want to draw a line right down the middle so it's easy to make sure both sides are symmetrical. You might want to do all the details on the head before you move on; getting the face in proportion to the body can be hard and it's easier to modify the roughed-in body to match a finished face than to try and correct things latter on. Once you have the figure all roughed in you just need to draw the nice smooth contours of a person over the bubbles. Clean up all the stray marks and you're about finished. You don't need to do too much in the way of details--the belly button is even with the point where the waist stops tapering in and the hips start curving out. Breasts can be just simple partial circles, most defined on the lower outside edges. Don't worry to much about hands or feet--they can take a lot of work, but a loose suggestion will usually be good enough. Now you have the basics of proportion to work with. When you're trying to draw a complicated pose, or elaborate clothes, it can be really helpful to find a picture in a magazine that's close to what you want, or get a friend to pose for you. That way, you can see where one arm crosses the other, or how a leg would look foreshortened from that angle, or whatever. It also makes figuring out how clothes fold or pull a lot easier. Just remember to keep them simple, too: Lots of detail on buttons or zippers is cool, but don't worry too much about getting every wrinkle and fold of fabric--a few simple lines is usually enough. For example, the image below was done based on a picture of a runner in Newsweek; any magazine can be full of dozens of great poses.